When an individual or business first decides to develop a website, many choose a group site-builder approach where you can easily launch a site without worries about hosting, back-end maintenance or coding of any sort. Examples of such services include BuildYourSite.com, Web.com, Wix.com, Weebly.com and WordPress.com (not to be confused with WordPress.org). There are many advantages to a group-hosted site – it’s generally very inexpensive, easy to get started and typically includes a menu of options from which you simply pick and choose to quickly create your site. When something goes wrong, it’s generally handled behind the scenes and each individual site owner likely doesn’t even know there was an issue. There comes a point for every successful website, however, when it’s time to move to what’s called a “self-hosted” option. This means that instead of having a site that is located within a network managed by a service provider, the website owner chooses a host company of its own and then manages the site software installation, maintenance and other back-end duties his or herself. Advantages to self-hosting include far greater control over site design, the ability to have a dedicated domain name/URL and unlimited options in terms of features, all of which are important to a business working to establish brand identity and its own unique delivery of products and services. Self-hosting, however, brings with it a whole new can of worms, one of which is a higher price tag than the group-hosted option. The temptation, particularly for a fledgling business with a tight budget, is to find the cheapest alternative possible. After hosting a string of websites using at least five different host providers, I’ve had my share of headaches directly tied to my choice of web hosts. Some have had a very clunky user interface and poor documentation, making it difficult for a newbie to figure out how to get things done. Others had slow … or nearly non-existent … customer service. It was not uncommon to receive a canned response suggesting I look in the host’s FAQ section (which of course I had already done) after waiting DAYS for a response to a help ticket. Still others simply pointed the finger back at me when there was a problem, suggesting my choice of WordPress theme, plugins or other feature was the problem. Some did okay in the customer service department but the service overall just wasn’t that great … slow loading times, frequent down-times, and/or unanticipated changes in terms of service. Most of these issues went away when I discovered Hostgator, a service I used for a couple years for what was then my main website, Log Your Memory. I was generally quite happy with Hostgator – there is a great deal of documentation available for troubleshooting issues, the support team generally responded within at least a day or two to pleas for help and the price was within reach considering the many features that came with it. As my traffic grew, I did have more site crashes than I would have liked and found myself needing to upgrade my plan more often than I might have desired, but I would still recommend Hostgator for those in need of a solid host for whom price is a major consideration. When I discovered WP Engine last spring, however, it quickly became my host of choice. First of all, WP Engine is set up to host WordPress sites … and ONLY WordPress sites. This allows them to cater to the specific needs of a WordPress site in a way that other more general hosting services cannot. I’m not particularly interested in the technical side of hosting (another reason I love WP Engine … they deal with the techie stuff, freeing me up to do the rest), but I do know that WordPress can be resource-intensive, particularly if you throw in a bunch of plug-ins and special features that can bog down your site. WP Engine handles this by specifically setting up its servers to handle these needs, in addition to automatically updating WordPress each time a new version comes out and auditing all sites hosted under them for “disallowed plug-ins,” which are plugins they have banned from use on their servers because of the problems they bring with them. The result is faster loading, properly functioning websites … a definite plus if those sites are YOURS. If your WordPress site gets hacked, no problem. WP Engine guarantees they will fix it for you. Installation of a new WordPress site is easy on any host … but it can’t get any easier than at WP Engine. One click of a button and presto – it’s set up and ready for use, complete with FTP access and a user-friendly hosting dashboard. Another great feature is the option to very easily create a “staging” version of your WordPress installation, which is a duplicate of your site on which you can make changes, test plugins or try other variations without the fear of harming your original site. Even better is the ability to build an entire site before needing to have its final domain name/URL in place. This means you can create an entire new site to replace one you (or a client) already have/has without messing up the original site. Once the new site meets approval of everyone involved, it is easy to point the domain to the new site and only then delete the original. The icing on the cake, though, and the reason I am entirely sold on WP Engine, is their customer service. The support team is friendly, communicates in language web designers of just about any level can understand, and most importantly, it’s FAST. An email help ticket is typically answered within hours, if not minutes, even on a Sunday. If the answer doesn’t come in the first response, followup is just as fast, sometimes involving multiple WP Engine reps. This tells me that their priority is getting your problem solved, even if it means they keep multiple guys & gals on staff to do so, all waiting to jump on the next message that comes in. Starting at $29 per month for a single WordPress installation and $99/month for a Professional 10-install account, WP Engine isn’t the cheapest host around. But after trying multiple hosts and living through far too many web-related headaches, I have no qualms about saying the service is totally worth the price. In fact, it’s the only host I am willing to use at this point … and I don’t foresee that changing anytime soon. If you’re ready for a self-hosted WordPress site, you owe it to yourself to check out WP Engine. I am reminded every day of how glad I am that I did. Celebrate Hostober! 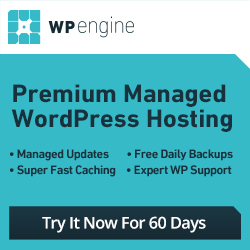 Sign up with WP Engine for an annual plan and get 3 free months of hosting! Just use the special offer code “hostober13” when you sign up to claim your free hosting.